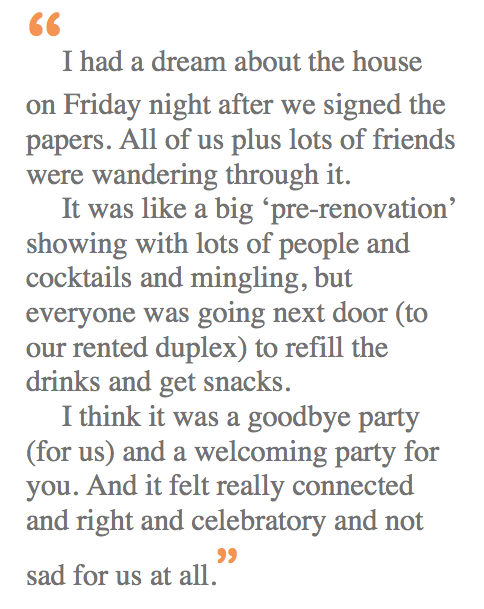 This is the lovely note we got from our sellers after the close. Have you ever heard of such a friendly sale? No drama, no strife. We’ve become friends, actually, and can’t wait for them to finally get to Detroit and start their own adventures. Plus, it’ll be nice to have them on site to feed us drinks and food and moral support when the going gets tough. If anyone knows what we’re facing, it’s these beautiful ladies. One of them had a blog, too, when they were deep in the planning process. Check it out if you want to read what they went through. Wow, what nice neighbors you’re going to have!